For two previous blog entries on Story writing in advance of development, here and here, Jeffrey Davidson was my collaborator and editor before publication. Jeffrey also wrote a companion piece to my argument for smaller stories here. He used to talk about these ideas at conferences with presentations like this one. Note, I have written before on BDD acceptance criteria for the well-known “Todo MVC” technology demonstrator app. In this article Jeffrey and I are extending our conversation about Stories. We both firmly believe in using Behaviour Driven Development (BDD) as the model for acceptance criteria and we’re taking the previous “candidate stories” examples as a starting point. This sort of stuff isn’t our primary area of work anymore, but it is fun and crucial to smooth flow of business ideas into production. And from that, we believe, gives a high return on investment, regardless of whether you intend to use the same BDD acceptance criteria for test automation. Bottlenecks can appear in any software development production line at any time. And as you solve them, a new bottleneck will appear somewhere else in the production line. One common bottleneck is with stories written weeks or months before developers start implementing them. Such stories can be viewed as vague and underdeveloped (under-specified?) by the time developers and test engineers take a look at them in order to estimate them. Alternatively, the elaboration of the story is missing key concepts needed to meet the business needs. Either of those issues lead to defects during development and waste later. Even when stories are well-phrased, misunderstandings may result in longer development time and unintended defects. Classically, the defects we focus on are those in production code that reach production. Defects can also happen in test code too. Sure, test code doesn’t reach production as such, but work being marked as “QA approved” when that wasn’t correct, is a real second-order defect. This happens when people misunderstand what they are testing. The same thing can happen for manual testing as well as test automation, of course. Dan North’s BDD encourages writing ‘scenarios’ using the words “Given, When, and Then” but otherwise uses plain English. Scenarios are perfect acceptance criteria. Writing them in the story definition in the story tracker (Jira, Rally, etc.) is expedient. For the initiate, “Given” focuses on the system’s existing condition; the state before the user roles performs a specific action. “When” describes the action the user takes. “Then” describes the results the users sees after the system responds. In all cases, this should be from the user’s perspective and written in business language. It should not be overly technical, include a host of design elements, or written from the system’s perspective. Note: For the rest of this article we are adopting the term “gherkins” instead of BDD acceptance criteria. This term was popularized by fans of Cucumber, the most popular BDD framework. The “candidate stories” article had the two stories from the Insurance domain. In that article they were referred by number. Both #11 and #12 and are worth expanding to have acceptance criteria in a gherkin style for this article. Note below that we’re using italics highlighting to hint at variance for lines we have used more than once. mid term, and offer a pro-rata refund of premium. Referring to “Login” in the Given lines is a mistake many teams new to this make. Much of the BDD community now agrees: please try as hard as you can to not begin gherkins with “Given I am logged in.” Unless your scenario is about logging into the system, you can safely assume this has already happened. When test engineers are automating the gherkin acceptance criteria, then tests should attempt to explore the functionality of the UI in a ‘microcosm’ stack that doesn’t require an actual login to test the focus area of the story. Your Given lines should assume the UI testing technology has a way of getting straight to the rectangle of the UI that is the subject of the test. I.e. bypassing a bunch of interstitial pages, including login. A glossary and style guide owned by the Product Owner (PO), or Business Analysts (BAs) are “must haves.” The glossary is all the terms the business and users would use to describe the system. A style guide defines look-and-feel elements and key user interface functionality. Using a style guide allows gherkin statements to be simpler and avoids unnecessary wordiness. A primary goal of gherkin statements is understandability; anyone with the business domain knowledge should be able to understand the steps and goals. Adding a glossary and style guide increase the team’s understanding of both the domain and the system. These documents also give guidance and will help the author write better acceptance criteria, improving them before review by the larger team. If you have a glossary and style guide it is important verify that new stories adhere to them before they are up estimation, coding, and test automation. In our insurance examples here, multiple terms would have an entry in the glossary: claw-back, pro-rata, cancellation, reinstatement, premium. With projects ranging across many years and multiple industries, we have found the above gherkin style to be a very good way for introducing BDD to teams. While some story writers find this to be a bit repetitive, this is an easy technique for getting started and clearly communicating system needs (up to its limits). Let us go further. There is no better or faster way to get a new business analyst up to speed, or a mediocre analyst up to ‘good’, than BDD. The following style of gherkin has some significant advantages over the above examples. It provides the information needed for test automation – it has variables and reduces some of the repetition found above. This approach uses data to describe the variations that would otherwise be repetitive. Our experience has shown it is easier for new teams to start with the simpler, language-only, non-data BDD. While it is possible to jump straight to the latter method, we find this stepping stone leads to better understanding of how to use this technique and increases adoption. Starting with the former gives the entire team the basis for building their business domain understanding. It also gives testers and test engineers additional time to develop the data required for scenarios; data needed for functional testing. We recommend teams adept with BDD shift to the second form earlier in the story elaboration cycle. That is, instead of developing the data during or after development is complete, the data scenarios can supplement or replace the text only versions prior to development. Having scenario data prior to development is an outstanding way of ensuring developers have a clear idea of the system expectations. We have witnessed this greater understanding leading to faster development, better code, and fewer defects. Kickstart Academy, a training organization where you get access to experts started a podcast series and I was privileged enough to be involved recently. Watch (click the image above or watch on Youtube) as Chris Matts interviews Kent McDonald, Jake Calabrese, and myself about the use and misuse of Given-When-Then, Behavior Driven Development (BDD), and business analysis in agile. If you are looking for more on Behavior Driven Development, then please check out my BDD Resource Page. Answer: This sounds like an interesting set-up. My answers, of course, will be a bit general because I don’t know all the specifics. Also, I will make more stories if the developers are unfamiliar with the systems / tables / data, and probably fewer stories if the team knows quite a bit about the different systems. With caveats out of the way, let’s dig in! First, 40 stories? Yuck. Too many. Second, because you have 3 different users, I would start with stories for satisfying all of them (unless there is a reason to focus on just one). My presumption is doing this adds value the quickest, which is my guiding answer for how to break up stories. As user #3, I want to view < information from 1 field> so I can do my job. As user #3, I want to see < more information > so I can . . . .
As user #2, I want to view < even more information > so I can . . . .
As user #1, I want to see < all the information > so I can . . . . The point of #1 is to prove we can display information, while the other stories add more details for the same and additional users. None of these is about editing the data. Depending on what keeps the users and developers happiest, there are a couple of options. I can insert story 1A; Edit the first field. After this I would insert more edit stories, probably grouped like the last 3 stories above, as appropriate. A different approach might be to insert the edit stories after the last story. Again, where is the value? It doesn’t make much difference if you use “see” or “view,” the goal is understanding, not the worlds best grammar. I would be remiss if I didn’t mention the value statement in your user story is a bit weak. What is the specific reason to view eligible employees; the actual awarding of salary increases, a validation check, a fascination with other people’s salary, something else entirely? It’s is with great pleasure that I announce Business Analysis is getting some official attention from both the Agile and Scrum communities! 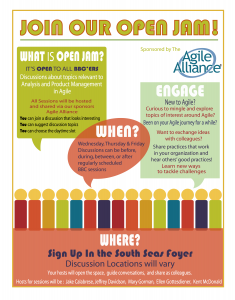 The first set of attention on us comes from the Agile Alliance . . . .
As we all know, ideas are cheap. It takes execution to make something great. That’s where Kent McDonald shines. He took our conversation (I do not recall if I ever showed him my notes) and made it real with a proposal to form an official sub-group within the Agile Alliance dedicated to Analysis and Product Management. Further, he received official blessing, permission, and funding for us to share our knowledge at BBC and upcoming events. The Agile Alliance board recently approved a new program, Analysis and Product Management in Agile, with the purpose of providing a way for practitioners in the business analysis and product management communities to share stories, questions, and puzzles about using those skills in an agile setting and to share ideas between communities. The program Chair is Kent McDonald. We’re pleased to announce that the first activity of this program is to facilitate an “(un)conference in a conference” at the Building Business Capability (BBC) conference where attendees can take part in conversations about the intersection of business analysis, business process, and business rules with agile principles and techniques. The members of the Analysis and Product Management in Agile program will curate the outcomes of the discussions and make them available to Agile Alliance members on our website. We’d like to thank the International Institute of Business Analysis (IIBA) and the organizers of the Building Business Capability Conference for helping us put together a means for members of the analysis, business rules, and business process communities come together to discuss agile approaches. Special kudos go out to Kent for organizing this program and Ellen, who did most of the communication and coordination between the program and BBC. The (Un)conference will run in an open area outside the sessions and keynote Wednesday through Friday. I am one of the hosts, along with Kent, Ellen, Jake, and Mary Gorman. If you want more information, here are the write-ups by Kent, Jake, and Ellen. Also, Yamo recorded a special podcast with Ellen and Mary. I joined for the last few minutes (at the 30:05 mark) to discuss the Open Jam. Shifting focus to the other good news . . . Apparently, the Scrum Alliance is also on board with our skill set, too! The next Global Scrum Gathering has a track dedicated to Scrum Product Owners (link to their call for Papers). I’m told this is the first time this has happened, previous conferences pushed their CSPOs into a track with other topics. 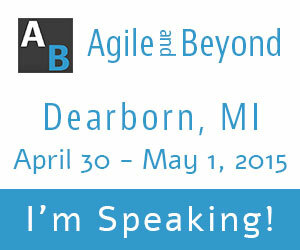 Note: I am a member of all 3 organizations discussed; IIBA, Agile Alliance, and Scrum Alliance. I presented How to Improve Your Requirements with Tiny Stories at ProjectSummit & BusinessAnalystWorld held in Boston on October 21-22, 2013. I firmly believe using the Given – When – Then of Behavior Driven Development (BDD) is relevant for business analysts. This talk is probably my best presentation of the material in the last few years. You are welcome to view the accompanying presentation below. I sill share the link for the accompanying video upon request (and after I upload it to YouTube).